Devil's Due Publishing, Inc. have made available 8 pages of pencils from their Sheena 99¢ Preview (available this March). 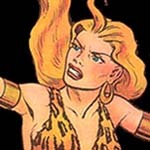 Sheena was originally created by Will Eisner and S.M. Iger. The Beat also has Sheena news and links to a Sheena web site with cool pics from the different Sheena projects and movies over the years. This page contains a single entry by GaryC published on February 11, 2007 3:03 PM. Will Eisner documentary teaser was the previous entry in this blog. Newsarama: Spirit movie panel at NYCC is the next entry in this blog.